I’m working with 3M today, to showcase some of the fun you can have with their super sticky Post-it Notes. 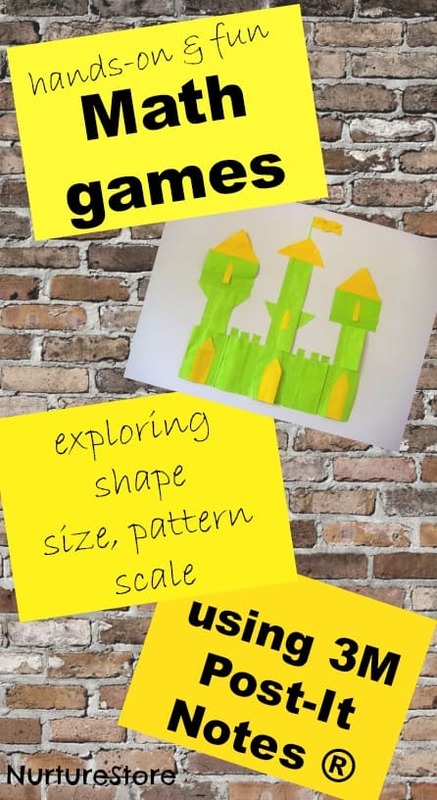 Here’s some hands-on math games you can try, exploring shape, size, patterns and scale, with some art and imaginary play thrown in for good measure too! My children seem to have inherited my love of new stationery, as they couldn’t wait to get their hands on the brightly-coloured Post-it notes that 3M sent us. 3M also sent us a challenge, to see if we could use the Post-it Notes to make some fabulous window art. They said that 3M Post-it Super Sticky Notes have an enhanced adhesive, which holds stronger and longer to a multitude of surfaces – and they’re right! It’s been disappointing in the past when we’ve used other sticky notes in games and crafts, because they always fall off half-way through. 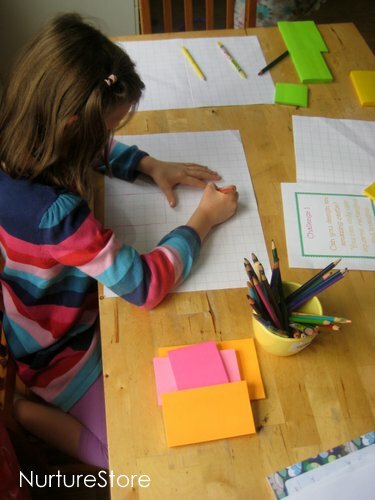 These 3M Post-it Notes have been fab though – holding in place on the window, wall and fridge door for days and days of play, and not leaving behind any marks either. We love combining all sorts of hands-on learning, so I decided to set the girls a few extra challenges, to bring in some math games too. Challenge #1: can you draw an amazing castle? I set out the 3M Post-it Notes with some challenge cards and some squared paper. 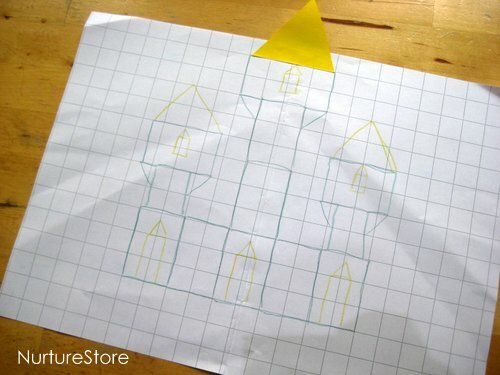 The first challenge was to draw out a fabulous castle on the squared paper, using only the shapes of the Post-it Notes: squares, rectangles and (folded) triangles. 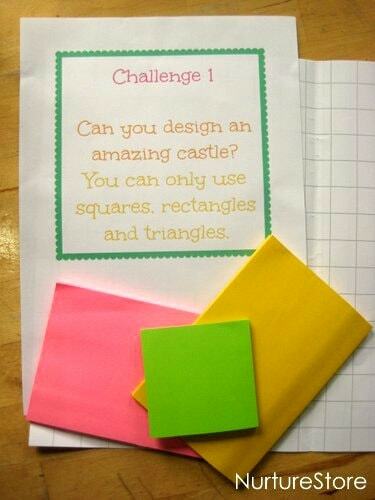 Challenge #2: can you build your castle on the window using Post-it notes? It’s also lots of fun to do this on a window – different and more fun than only using paper, especially when passers-by stop and look up at your design as they walk down the street! Challenge #3: can you draw someone who lives in your castle? And why stop at math games, when you can bring in art, storytelling and imaginary play too? 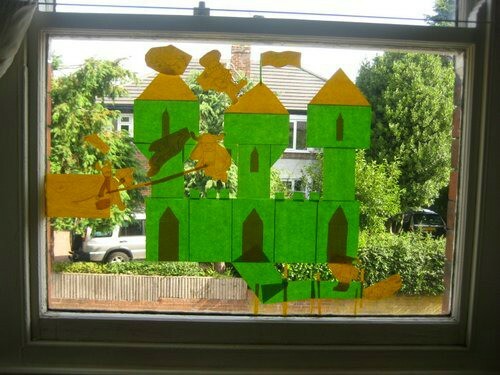 As the 3M Post-it Notes peeled-off and re-stuck themselves so well, they were perfect to use to create some extra characters to live in the castle. You can move the characters and keep re-positioning them around the castle – giving us a fab window display with lots of added imaginary play. I love how you approached this! 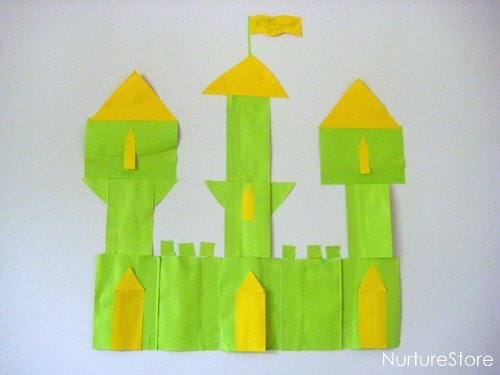 The castle looks fab, and you surely put these sticky notes to good use! Very cool! Never thought to use post-its like that! I think the possibilities are endless now! What a fun idea! Yay for sticky notes that stay stuck! Awesome! I love how you combined math, art, and storytelling. 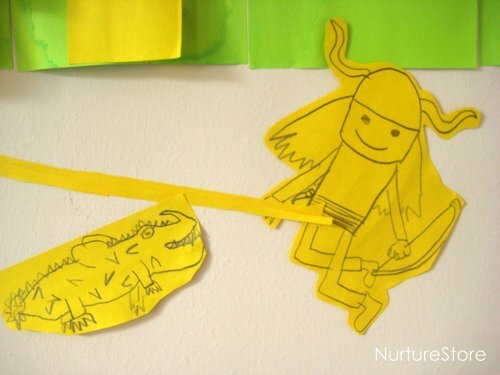 Now I want to create with post-it notes! 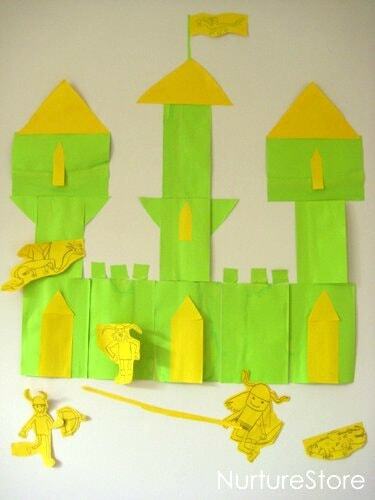 Well, I have never really thought to do something so impressive with post-it notes before. What fun! Thanks. love this! I would’ve never though to use post-its in this way!